Do You Get In Any Reading Over the Holidays? A few years ago, I got the idea that I should read “The Chimes,” Charles Dickens’s other famous Christmas story. I found a free digital edition on Project Gutenberg, downloaded it to my iPad, and started reading one afternoon. I hadn’t made it very far in when I was distracted by a phone call, and then I remembered a bunch of other reading I had to do for work—the upshot being that I didn’t came back to “The Chimes” until the following December. Didn’t finish it that year, either, although I made it further than the previous effort. Last year, I almost reached the end of the first quarter. My adult holiday traditions, such as they are, just haven’t involved reading—and the reasons for that are rooted in the one exception that I can remember. At the end of my first semester in college, I was called home the night before final exams when my father’s truck slid off an icy patch of road and into a tree. He died the next day, and that holiday season became a long cycle of grief and frustration. 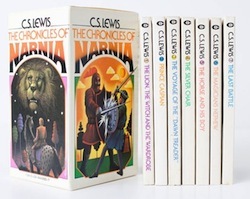 I was still sharing a bedroom with my brother (when I was home, anyway); at some point, I hit upon his boxed set of C.S. Lewis’s The Chronicles of Narnia. I’d never read the series—as a teenager, I’d been more into science fiction than fantasy—but I needed a distraction, so I opened The Lion, the Witch, and the Wardrobe and began reading. In retrospect, a story about young children torn from their parents who find refuge in a magical kingdom seems a bit on the nose. At the time, though, Aslan was just what I needed—and even though I read all seven books before it was time to go back to school, I confess Aslan rising off the table is my only firm memory from any of it. Whom or What Are Literary Awards For? Personally, I think it’d be great if the National Book Awards were as prominently celebrated in our mainstream culture as, say, the Oscars or even the Tonys—but that would require making books more “mainstream” than they are now, which would be a pretty big project, beyond our present scope. Unfortunately, the takeaway from the initial discussion was that the NBA judges were being chastised for “recognizing lesser-known authors for the sake of choosing lesser-known authors,” when they ought to be putting forward books more in alignment with the serious reading public’s sensibilities, as reflected either in the critical appraisal of mainstream reviewers or in actual sales, or in the place on the Venn diagram where those two circles overlap. I take the exact opposite point of view. I would never presume to describe myself as a “well-read” person, so, for me, the National Book Awards shortlist has always been about the insights of five people who’ve been given the opportunity to spend a year (roughly) cultivating as close to a comprehensive perspective on contemporary American literature as anyone is likely to possess. What have those five people seen that I and other readers have missed?